The BMW brand stands for dynamics, innovative technologies and decades of Motorsport experience. BMW M Performance Parts transfer this knowledge from the racetrack to the street: With retrofit components in the categories of aerodynamics, drivetrain, cockpit, and chassis, you can further enhance the uncompromising sportiness of your BMW. Only the best is good enough: Inspired by Motorsport, the entire range of BMW M Performance Parts impresses with top-class functionality and design. Each and every product meets the high standards set by BMW and offers unbeatable quality and longevity. This is achieved by combining the best materials available with a highly sophisticated development and production process and comprehensive quality testing. To ensure the perfect synergy between function and design, all components are precisely tuned to the individual BMW model. BMW M Performance Parts are available for many BMW and BMW M models in the four categories of aerodynamics, drivetrain, cockpit, and chassis. Whether you’re looking for a sportier look, an impressive sound or a performance-enhancing power kit – with each individual product, you make a conscious statement of your passion for Motorsport and your desire for individuality. Experience BMW M Performance Parts in action. BMW M Performance exhaust systems set the tone – in every respect. Manufactured in top quality, these components not only provide an extra-sporty sound, but also help to reduce exhaust pressure. This, in turn, improves driving dynamics and optimizes the engine characteristics. Premium tailpipe finishers in chrome, carbon or titanium impress with their exclusive high-tech look and emphasize the striking appearance of your BMW. Tackle air resistance head-on: With BMW M Performance aerodynamic components, you enhance the downforce and driving characteristics of your BMW. Not only that, but you also boost its athletic character and give it a Motorsport look that perfectly complements the vehicle’s design. Images and films of BMW Performance Parts – for you to view and download. Get in and take a pole position immediately: With BMW M Performance components, you can create an authentic Motorsport atmosphere inside your BMW – whether with the puristic stainless-steel pedal covers, exclusive carbon elements or an Alcantara steering wheel with carbon trims and race display. Sportiness right down to the last detail: As soon as you set eyes on the BMW M performance key case, you'll notice that it exudes pure Motorsport passion. Made of top-quality black Alcantara, it has blue decorative stitching and an M Performance carbon-look. 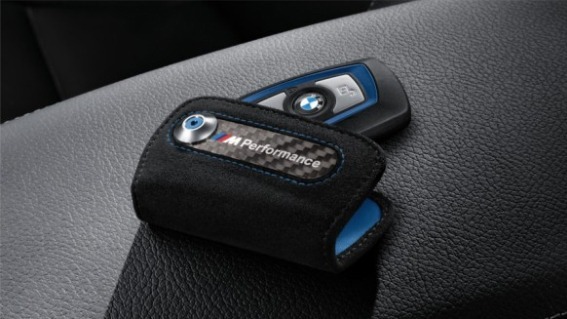 The case protects your BMW key from scratches and dirt and prevents the keys from being pressed unintentionally. The key can be twisted out to the case easily, meaning that it's always ready for use in an instant. Not just a question of looks: BMW M Performance Parts let you adjust the chassis of your BMW to suit your needs and your driving style perfectly. Whether light alloy wheels, shock absorbers, or brake systems – all components originate from Motorsport and meet the highest design and functionality standards. The result: striking aesthetics combined with outstanding agility. Ever since BMW returned to the DTM in 2012, BMW M Performance Parts has been a premium partner of BMW Motorsport. And it’s been a partnership crowned with success. In its comeback season, BMW not only recorded 12 podium finishes, but also achieved a sensational victory in the Constructorsʼ Championship. BMW Motorsport repeated these successes in 2013 and 2014, forcing their competitors to take a back seat yet again. The recipe for success: innovative technologies and top quality standards combined with a desire for optimum performance and full-blooded Motorsport passion. Characteristics that are also integral to BMW M Performance Parts, making them a proud partner of BMW Motorsport.